The project research team looking pretty cool over in Kazakhstan in August 2016. I’ve recently come back from a project research meeting and it’s been a real learning experience. Not only is the project cross-disciplinary (we’ve got environmental scientists, computer scientists, epidemiologists, toxicologists and social scientists involved) but we’re also working across nations. One of the big challenges so far has been data. I’m quite used to be able to get hold of lots of different types of data from the UK and, if it’s not available, being able to get out there and collect new data. This has, for various reasons, been a little more challenging in Kazakhstan. I’m pretty sure that we’re still going to get some good results (watch this space!) but it’s been harder work than I thought it would be. Thinking more broadly (and I’ve not mentioned Brexit on the blog so far) I wonder if this has implications for a shift away from EU funding/collaborations, which might occur post-Brexit, and towards work in developing nations, assuming that the Global Challenges Research Fund expands and takes off. Whilst there is probably more scope for impact in developing nations, that work might be more difficult because the research infrastructure (including data archiving) is not so well developed. Excellent read on 2 levels: the actual biography is really enjoyable and authoritative because of Rolt’s access to Brunel’s papers; and the introduction describing how Rolt’s hatchet job of John Scott Russell (the “other” engineer on the failed SS Great Eastern project) is probably unfair is fascinating from a historical/interpretation point of view. Overall, I came from a position of relative ignorance about Brunel’s life and work and was surprised at how unsuccessful Brunel was a commercial engineer (though his innovation is almost unrivalled). Somehow, I have now been a lecturer at Brunel University for 3.5 years. It seems like only yesterday that I was starting this blog as a postdoc at the University of Manchester. In those 3.5 years my responsibilities have expanded (at home and at work) so, as I said in my last post, blogging has taken a backseat, which is a shame as I quite enjoy it. 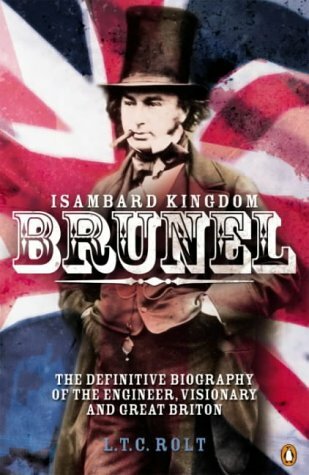 The point of a brief autobiographical introduction is that my knowledge of Isambard Kingdom Brunel’s life and work was relatively low when I took the job here at Brunel University. I knew he was an official, BBC advocated “Great Briton” but that was about it. I did have a little go at addressing the conflict of being a climate scientist at a university named after one of the fathers of the Industrial Revolution on my work blog recently (and in a talk for the London Science Festival) but I still felt that I really needed to find out more. So I picked up a relatively old biography – LTC Rolt’s Isambard Knigdon Brunel, first publsihed in 1957 – which is still considered authoritative as Rolt had unprecedented access to the Brunel archive. I’m glad I did. It’s really well written and has a nice mix of quotes from contemporary documents and descriptions of the engineering projects alongside important personal events. It flows really well too, which is surprising given the temporal overlap of much of Brunel’s work: I’ve tried to summarise this overlap in a little timeline that you can see below. A timeline of Brunel’s major projects. Bridges and tunnels are shown in blue; railways in black; ships in red; and other projects in green. Start and end dates are not definitive. I’ve washed out the shading where a project continued without Brunel’s intense contribution. Brunel died in 1859. The timeline also demonstrates how Brunel’s work was very intense (in a relatively short life – 1806-1859) and covered a wide range of areas: tunnels, bridges, railways, ships and other projects. As an academic, I was quite interested in Brunel’s “impact”. What surprised me was that relative few of his projects were successful commercially. His ships were all failures commercially. The Thames Tunnel was a death trap that was never used for its intended purpose. The Great Western Railway’s legacy is somewhat tarnished by the “Gauge Wars”. Perhaps this is a harsh summary of his work but it made me feel a bit closer to him: he wasn’t a great businessman but he was a successful innovator and researcher. His ideas were ahead of their time and were difficult to monetise in that period. His longer term legacy was much more important and changed the way that engineering was done globally. Perhaps the most interesting passages in the book are those relating to John Scott Russell, who worked on one of Brunel’s biggest failures: the SS Great Eastern. Rolt tries to argue that Scott Russell was the villain in that piece and deliberately tried to undermine Brunel’s ship. However, the excellent introduction (by RA Buchanan) highlights some of the flaws in Rolt’s argument and supposes that Rolt’s position was driven by his desire to absolve Brunel of the SS Great Eastern’s failure and was biased by the contents of the Brunel archives. Congratulations are in order for my Institute for the Environment colleagues who work on chemicals in the environment – they’ve just been awarded the Queen’s Anniversary Prize for Higher and Further Education! Brunel University has led novel work over 20 years period and significantly influenced European legislation banning the discharge of hormone-disrupting and other chemicals into wastewater, improving water quality and benefitting human health and aquatic life. I initially though I had the wrong address for this event. In the shadow of the Swiss Re gherkin and the Lloyds building, I wandered into the Willis Tower and was surprised not to be asked to leave. Then, my second surprise, I saw the registration desk for Climate Change Question Time. It turns out that the event, organised by the Knowledge Transfer Network in Industrial Mathematics, was aimed largely at City types, particularly the insurance industry. That said, there were some big names in policy circles and high-level representatives from most of the big climate science groups within a short-ish train ride from London (Reading, Imperial, Cambridge, Oxford, UEA, BAS, Southampton and, of course, Brunel ;)). It was interesting stuff though I expect what most people took away from the meeting was that Tim Palmer really (really) wants a massive computer and he doesn’t care who pays for it. Tim Lenton: Don’t fall in love with your model. Whilst the results of a model projection give you enormous ability to understand processes within the model, you mustn’t forget that the model is not the real world. Tim Palmer: If God exists, he isn’t a climate modeller. …because the two key scales to successfully modelling global climate are those relating to baroclinic instabilities (on the order of 1000s km) and convective instability (10s km). Achieving this is not easy. Vicky Pope: Low climate sensitivities (below 2°C) look unrealistic from latest model runs. As cloud processes have improved in Earth system models, it looks like it is the lower end of the IPCC climate sensitivities that will be affected most. Alan Thorpe: Parameterisations are not dirty. …in response to a question about “tuning” climate models. Abyd Karmali: We use yesterday’s science to inform today’s policy that drives tomorrow’s financial markets. Adair Turner: Achieving 80% emissions cuts in the UK by 2050 is still possible. John Beddington: Identifying and monitoring signatures of tipping points is essential. Ralph Cicerone: The public think that a “climate model” is a [physical] toy. The Campaign for Science and Engineering in the UK (CaSE) last night hosted a debate between the science spokesmen of the three main parties: Lord Drayson (Lab), Adam Afriyie MP (Con) and Dr Evan Harris MP (LibDem). Firstly, what a great development this is for science policy in this election year – science and engineering have a massive impact in the UK and any effort to “Make science an issue” has to be applauded. The debate can still be viewed here. Ok, what about the debate? Well, the opening statements from Drayson and Afriyie did not fill me with confidence. Afriyie wants to “get Britain working again” – to me, this sounded like he thinks science in this country is broken. He probably didn’t mean that and was just mindlessly spouting a party slogan but it’s not how I would have kicked off if I was in his position. 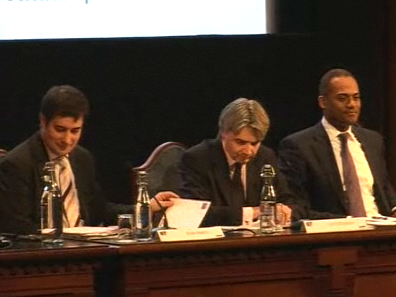 Drayson started off by saying that there “have been no cuts” in the science budget. I’m sure that most people relying on STFC funding (a topic that was brushed under the carpet in this debate) might find that like a kick in the teeth. In this company, it was not hard for Harris to tower above his opponents on the scientific, as well as general political, issues at hand. 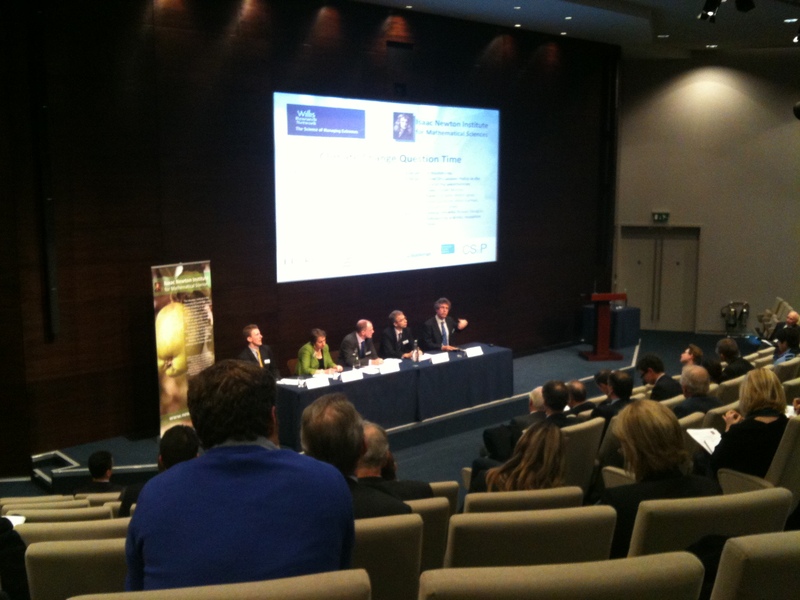 Given the topic of my previous blog post, I was keen to hear the panel’s views on the “Impact” agenda. However, as seemed to be a problem with the debate format, the question (“What impact do you expect from government funded research?”) was a bit vague and the initial answer from Drayson was very fluffy. Harris was negative with respect to the Impact Plan, espousing the merits of blue sky research with unknown impact. Afriyie picked up the ball and gave more of an opinion on the impact debate and mirrored my own (and the research council’s) views that getting scientists to think about impact at the proposal stage is no bad thing but it should not be used to determine funding decisions. However, when a question on private/public funding of science came up, Afriyie then seemed all for more applied research to close the “innovation gap” between top quality research and industrial output. Afriyie later well and truly dropped the ball on the subject of Prof. Nutt. His view seemed to be that ministers should be free to sack any “advisor” they have for any reason at all! (This also missed the point, made by @SmallCasserole on the Twitter #scidebate feed, that Prof. Nutt was not a personal advisor; he was the head of a statutory body.) Afriyie’s opinion seemed even more ridiculous as, in response to a previous question on scientific knowledge within the House of Commons, he had described his passion for evidence based policy. This evidence can, presumably, be cherry picked from whichever advisor suits your opinion. Libel reform also got a lot of support from all on the panel. However, given that the question (as well as most of the momentum behind the libel reform campaign) came from Sense About Science, Afriyie’s assertion that he was making the libel reform case “very loudly within the Conservative Party” rang a little hollow after Zac Goldsmith’s pathetic hatchet job of Sense About Science in the Guardian’s CiF. So, my conclusion from all this is that Drayson was keen to keep his head down; Harris is clearly a massive bonus for parliament even if his chances of becoming the next Science Minister are relatively slim; and that Afriyie veered from good (repaying student loans for graduates going into teaching, compulsory “science lessons” for all Conservative MPs) to catastrophic (Prof. Nutt, David Cameron’s “zeitgeist” being enough to increase donations to medical research charities). But I am excited about this interaction between science and politics and really hope that this is widespread and continues all the way to the general election this year. 1) The Research Councils (such as EPSRC and NERC) now require an “Impact Plan” to be written and submitted with grant applications. 2) HEFCE are planning to assess the impact of past research as part of the next systematic assessment of UK research (i.e. the REF, formerly the RAE). In the case of NERC, to whom I have recently submitted a couple of proposals, their guidelines state that the funding decisions will still be taken on the quality of the science. The NERC Impact Plan can, in fact, be re-written after the funding decisions have been made if scientifically excellent projects have included an inadequate Impact Plan. However, my experience was that going through the process of thinking about who would be interested in the work and how I could involve them throughout the project improved the focus of the whole proposal. This is the main reason why I have been supportive of the Impact agenda despite being initially sceptical. …this later point is the justification behind the HEFCE half of the Impact agenda. This is the retrospective part and would give credit to blue skies projects that, perhaps inadvertently, had a big impact. How about this case though: after a period of decades of research, a certain field has had no quantifiable “impact”. Then why should this field continue to receive public funding? Similarly, if another field is found to be almost entirely beneficial for a certain industry, then why should that industry not fund that research? We surely need to know these things. These hypothetical cases are obviously the two extremes and funding decisions will always be in grey areas but it seems silly not to do something because it’s not easy. But the REF doesn’t only assess economic impact; it will also consider impacts on society, public policy, culture and quality of life. One of the other arguments against the impact agenda is that is has not been particularly well planned. Well, as an argument against writing plans for an aspect of a project, this seems a bit naff: “we won’t write plans for our impact because your plans to assess our plans are not very well planned”. Anyway, the Impact Plan seems to have been well implemented (obviously, I would say this as I got good feedback) – there is lots of guidance on the NERC website and there is a transition period where Impact Plans can be re-written. As for the REF, well this will be a retrospective assessment of impact so it doesn’t matter how it is planned as long as it is consistent. The next REF isn’t until 2013 anyway so there’s plenty of time to get the details straight. As for my experience of the Impact Plan, I now have extra funding from the proposal to visit users, to organise workshops for academics and the user community and to develop resources for public engagement activities! I am happy.